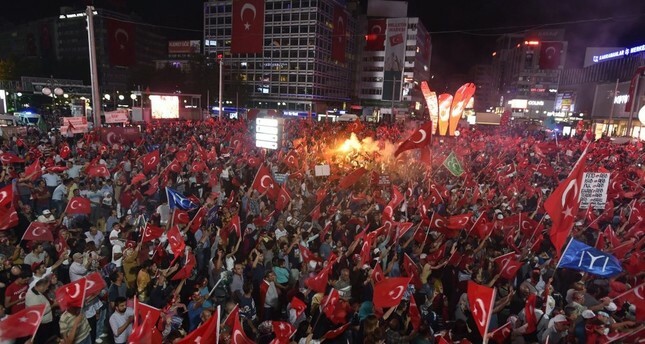 The coup attempt on June 15, 2016 failed after encountering huge public backlash against the FETÖ-led military's attack on the democratically elected government. An Ankara court on Friday ordered the arrest of 23 officers for links to the Gülenist Terrorist Group (FETÖ). The suspects include seven majors and 10 captains, and all are employed by the Gendarmerie Command, which is responsible for rural law enforcement. All but three were suspended pending criminal investigations. The suspects are accused of periodically contacting their imams by pay phones to escape detection by their superiors. FETÖ was behind the July 15, 2016 coup attempt, and since then, thousands of people linked to the secretive group have been detained or arrested. The coup attempt on July 15, 2016 killed 249 and was quelled thanks to strong public resistance. The coup attempt was plotted by FETÖ's point man controlling the infiltrators in the Turkish Armed Forces (TSK), according to prosecutors. Coup trials started in December 2016 and continue across Turkey. Hundreds of officers, including those who attempted to kill Erdoğan, were sentenced to life imprisonment in concluded trials. Larger trials, including one where more than 400 people are being tried for taking over the military's main headquarters, are expected to be wrapped up later this year. FETÖ, a criminal enterprise founded by fugitive Fetullah Gülen, has been directly implicated in the December 2013 judicial coup attempt and the July 15, 2016 military coup attempt against the democratically elected government of Turkey. Dating back to the 1960s, FETÖ was the brainchild of Gülen who served as a primary school educated imam before founding the group, which has always acted as a secretive cult. Its leadership hierarchy was hidden from the public, apart from Gülen himself. FETÖ, like many terrorist groups, created a structure based on individual cells within various state organizations, like the judiciary, police and military. Over the years, FETÖ transformed into a behemoth, with finance, business, education and media arms spread across the globe. It has charter schools in the U.S., mainly used to collect and siphon federal funds for various FETÖ projects, while its schools in the rest of the world are usually used for recruiting. Gülen is viewed as a sort of messiah by his followers, according to former members.